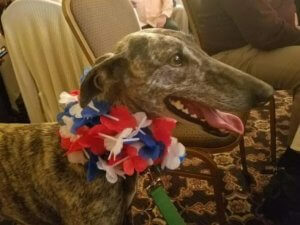 American Greyhound to Help the Galgos! If you were at the auction on Saturday night, April 28 you already know about the big surprise we unveiled, which was that during our live auction, we rolled out six galgo dogs, fresh off a flight from Madrid, Spain! For those of you who aren’t familiar with the galgo, they are a greyhound-like dog from Spain which are used primarily for hunting and coursing. And, they are quite likely the most abused breed of dog on the planet. 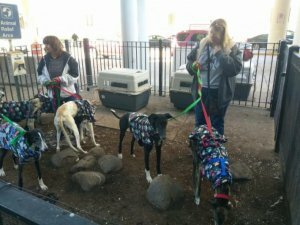 Last week, American Greyhound, as part of a cooperative effort with other greyhound adoption agencies, welcomed twenty four galgos into the United States and a whole new lease on life. In March of this year, we were contacted by a woman from Colorado who had put together a project with a goal of bringing thirty five galgos into the United States from Spain. 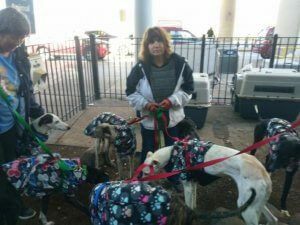 They needed another partner who was capable of welcoming some of the galgos into their adoption program. And, as it turned out, our geographic location would allow us to assist in welcoming the dogs when they arrived at O’Hare and transport the dogs heading to Colorado to a holding facility near Kenosha, Wisconsin. Once the final plan was in place, the project was able to bring in a total of twenty four galgos into the country. 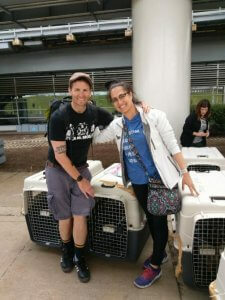 The Galgos in the turn-out pen at the O’Hare international terminal on Wednesday, with companions Lee and Pat. All twenty four of the dogs were selected from a special group of dogs in the Scooby shelter in Spain, called “The Forgotten galgos” which were made up of dogs that had spent an above-average amount of time in the shelter, and really needed a chance to get out. Many of these dogs were very shy and easily spooked, but many just seem to have been overlooked due to the mass numbers of dogs in the shelter (it is not uncommon for the shelter to house 500+ dogs at a time). Lalita enjoying the 8th Annual Winning Hearts benefit auction on Saturday. Last Tuesday we began the process of welcoming the dogs, meeting eight dogs per day for three days. Of the twenty four dogs, eleven went to a group in Colorado, two went to a group in California, and the remaining eleven came to American Greyhound. Each of the three groups of eight dogs was accompanied back to the states by at least one companion who flew the same flight and helped us transition the dogs from the airline crates into the American Greyhound hauler. 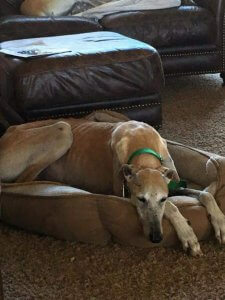 Clarete rests after arriving at his foster home. 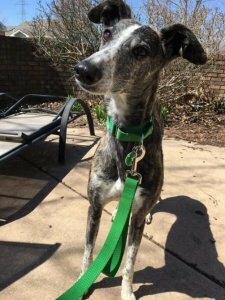 While we have already placed one of the eleven dogs into adoption (he will be going to a family who had already looked to adopt him prior to American Greyhound claiming him), we do want to spend some extra time working with a few of the more skittish dogs that we received before placing them in loving homes. Silvino poses in the yard at his foster home. Also, these Galgos will require a special home, as many can easily go over a five-foot fence, so they will require a little more commitment than most of our retired racers. Paluco at his foster home. Look for more information on these new members of the American Greyhound family in the days to come. 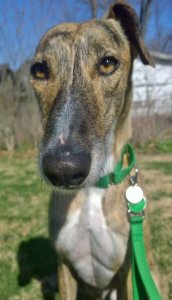 If you have questions, don’t hesitate to contact Foster Coordinator, Nicole Graves at foster@americangereyhound.org or Jeff Coggins, at president@americangreyhound.org. Also, please take a look at “Daphne Legacy Tour” on Facebook. In the slides created to highlight each dog on their Facebook page, you’ll note that the American Greyhound dogs are the ones with a green icon in the upper left-hand corner. We look forward to a long mutually beneficial relationship with Daphne Legacy tour and on future transports, we’ll be looking to enlist some American Greyhound volunteers on the trips to Spain to help prep the dogs and then accompany them back to the states. Another turn-out photo from Wednesday. Daphne Legacy Tour founder Christina and her husband Dray just after arrival on Thursday.